Afghanistan 2014. Approaching the withdrawal of troops, Captain Antares Bonassieu and his section are assigned to a control and monitoring mission in a remote valley of the Wakhan, Pakistan border. Despite the determination of Antares and his men, control of this so-called calm sector will gradually crumble. On a September night, some soldiers start to mysteriously disappear in the valley. After studying at the École Supérieure des Arts Décoratifs of Strasbourg, and at the Fresnoy-National Studio of Contemporary Arts Clément Cogitore develope an artistic practice halfway between cinema and contemporary art. Combining film, video, installations and photographs his work questions the modalities of cohabitation of men with their images. There is often question of ritual, collective memory, figuration of the sacred as well as a particular idea of the permeability of the worlds. His films have been selected for numerous international festivals (Director’s Fortnight Cannes, Locarno, Lisbon, Montréal…) and won several awards. His work has also been screened or presented in various museums (Palais de Tokyo Paris, Centre Georges Pompidou Paris, Haus der Kultur der Welt, Berlin, Museum of fine arts, Boston…). In 2011 he was awarded by the Grand prix du Salon de Montrouge for contemporary art and in 2012 was resident of the Villa Medici, French Academy in Rome-Villa Medici. 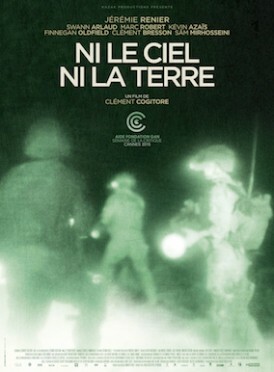 In 2015, his first feature film “The Wakhan Front” was selected at the Cannes international film festival – Critic’s week, awarded by the Fondation Gan and acclaimed by critic. Born in 1983 in Colmar, Clement Cogitore lives and works between Paris and Strasbourg.